Goetz was quite capable to start his own business after working with master Dominal as journeyman for two years however, he wanted to learn more skills to round out his personal artistic goals, and they were many. 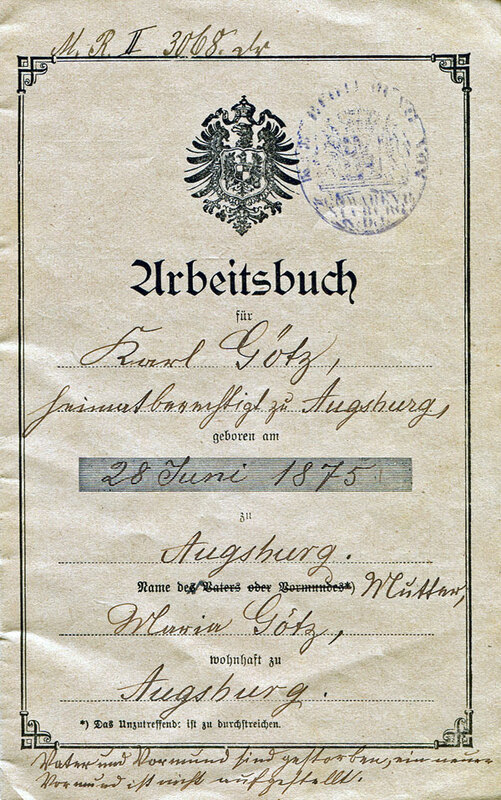 With workbook and suitcase in hand, Goetz left his birthplace of Augsburg on June 27, 1895 traveling a short distance, northeast, to Dresden. A journeyman carried his Arbeitsbuch (Workbook), as seen to the right, while traveling and working in order to document where he had been, who he had worked for, what position he held, and for how long. Goetz' personal Arbeitbuch shows a very busy and productive nine year period between working in Augsburg and starting his business in Munich. Let's take a look. As mentioned above, Goetz first traveled to Dresden where he secured a job with Cohne & Northman as a graveur's assistant until November 2, 1895. At this time he quickly relocated to Leipzig and began working for Hugo Kuntze . Here, too, he worked for the Graveur as a graveur assistant until June of 1896. Off again, this time to Berlin to work for F.C.Wahl. Goetz spent nearly a year and a half as graveur assisstant with Wahl perhaps to allow himself the valuable sculpting instruction under Professor Max Kruse, sculptor at the Royal Academy of Arts, and figure drawing from fine art painter Schmidt. Goetz also began taking French language lessons in preparation for his goal to work in Paris. Goetz continued his journeyman work by moving to Duesseldorf in September 1897 where he worked for C. Schnürle while staying for just five months until February 1898. Goetz gained experience in some medal work while assisting Schnürle with stock medal designs. Although Goetz was undoubtedly exposed to the art of the medal prior to this job, this is the first documentation that suggests he actually gained some experience in the creative process of medal making outside of his journeyman graveur assistant work. February 16, 1898 marked the first day of employment with the Koninklijke Beeger (Royal Graveur) in Utrecht, Holland. Goetz worked here for a year assisting Beeger with the execution of Honor and commemorative medals, medallions, plaques, and plaquettes for the Royal Dutch court. He gained an excellent reputation there and was much respected by his supervisors. They wanted him to stay, but Goetz held to his plan to learn more and become better in all fields of medal making. 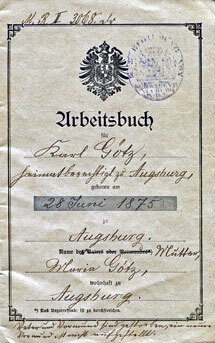 On March 16, 1899 Goetz began working for Monsieur Hugenin of Le Locle, Switzerland. This position provided him with unstifled work. good treatment, and excellent pay. Goetz was paid 75 francs a week. "I got richer and richer," he said, "I only needed 1.50 francs per day." He also continued his French lessons in the evening (which he had begun in Berlin). He said goodbye to Le Locle on September 9, 1899 and arrived in Paris one week later, September 16, 1899.